Magellan Models has launched a dramatically redesigned website with leading edge design, enhanced navigation, detailed product information, and bold new colors. 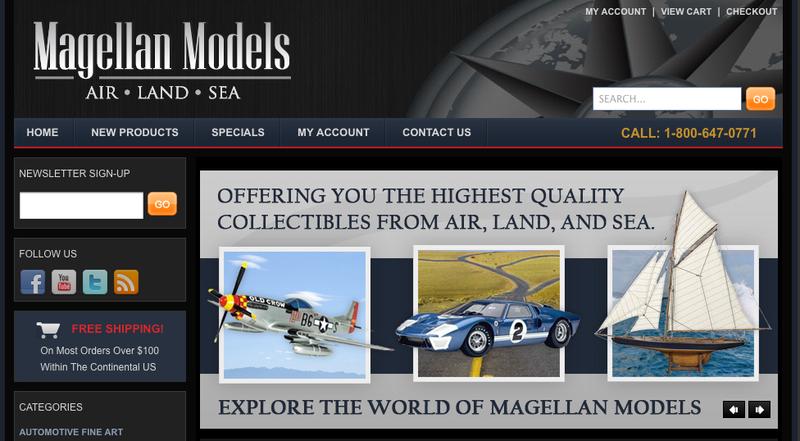 Magellan Models is a leading source for wooden desktop airplane models, model ships, diecast model airplanes, and diecast model cars. The newly redesigned Magellan Models e-commerce website, MagellanModels.com, embodies the company’s forward-thinking vision and commitment to customer service. Extensive research into customer suggestions and needs influenced the new website design and product content material. The newly redesigned website includes a new homepage layout that assists consumers with navigating product categories and simplifies the buying process. Enhanced images and detailed product content provide a seamless experience from item selection to checkout.